What Are LED Lights, Exactly? Lately, more than ever, the three letters “LED” are making their presence widely known in the lighting department. LED light bulbs are commonplace in many homes these days, with many people preferring LED lights over incandescent lights for their bright luminescence and energy-saving qualities. Despite the popularity of these light bulbs, however, how would you describe what LEDs are, exactly? At New Edison Lights, our Longmont commercial LED lighting company has found over the years that while many people are familiar with the general concept of LED light bulbs, they don’t know much about the ins and outs of these efficient, bright lights. Do you? We’re not here to grill you on your knowledge of LEDs, but we do think it would be interesting to do a high-level rundown of these eco-friendly lights. Read below to learn more, and feel free to learn more about our industrial lighting solutions and what we do here at New Edison Lights by visiting this page. For starters, you should know that “LED” stands for “light-emitting diode.” LED lighting products are highly praised by homes and businesses because they produce light approximately 90 percent more efficiently as compared to incandescent light bulbs. In LEDs, an electrical current passes through a microchip, illuminating the tiny light sources we call “LEDs.” The result is visible light, and to prevent any performance issues from occurring, the heat that LEDs produce is absorbed into a heat sink. 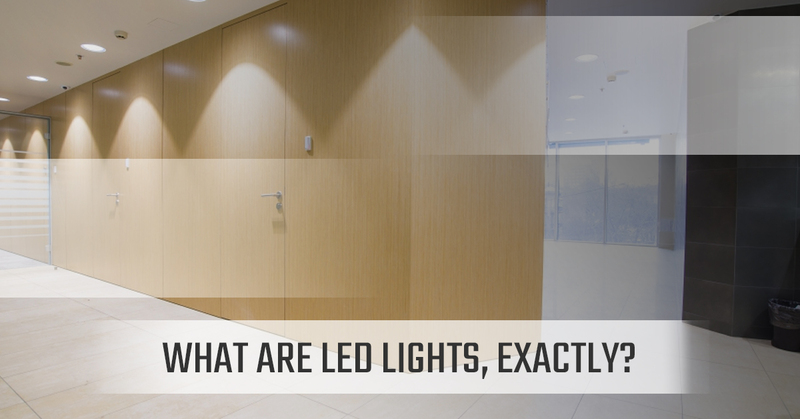 The “useful life” of LED lighting products is defined differently than that of other light sources. Conventional sources of lighting like incandescent or compact fluorescent lighting (CFL) bulbs burn out over time to the point where hitting a light switch does not produce any lumens, or light. However, LEDs typically do not “burn out” or fail in the same way that these bulbs do. Instead, LED light bulbs experience what is known as “lumen depreciation,” in which the brightness of the LED dims slowly over time. So, unlike incandescent bulbs, the lifetime or usability of an LED bulb is established on a prediction of when the light output decreases by 30 percent. Just like incandescent light bulbs and CFL bulbs, LED light bulbs are incorporated into bulbs and fixtures for general lighting applications whether they are residential or commercial. LEDs are relatively small in size and provide unique design opportunities when it comes to lighting. Some LED light bulb solutions may physically resemble familiar light bulbs and better match the appearance of traditional light bulbs, and some LED light fixtures may also have LEDs built in as a permanent light source. Hybrid approaches to lighting are also available on today’s lighting market, where non-traditional light bulbs or a replaceable light source platform is used and specifically designed for a unique light fixture. Customization and design opportunities and possibilities are two considerable advantages of LED lighting solutions. As compared to traditional lighting technologies, LEDs offer a massive amount of potential for innovation in lighting technology and fit a wider breadth of applications. Heat is a central and important aspect to LED lights. LEDs use heat sinks to absorb the heat produced by the LED itself so the heat dissipates into the surrounding environment, ultimately resulting in clean, naturally-diffused light. These heat sinks are what keep LEDs from overheating and burning out. Thermal management is an important term and arguably the single most important factor in determining the successful performance of an LED over its useful lifetime. In general, the higher the temperature at which the LEDs will be operated, the more quickly the light will degrade, leading to a shorter useful life. LED products on the modern-day lighting market tend to use a variety of unique heat sink designs and configurations in order to efficiently manage the heat. In recent years, advancements in materials have allowed manufacturers to design LED light bulbs that match the exact shapes and sizes of traditional, incandescent light bulbs. That being said, regardless of what the heat sink design is on a given LED bulb, all LED products that have earned the Energy Star rating have been tested to ensure proper heat management. This helps make it so that the light output is properly maintained through the end of the LED’s useful life, or rated life. This is only a basic, high-level overview of LED lights, but our Longmont commercial lighting specialists like our customers to understand the nuances of efficient, modern lighting – especially as LEDs continue to become the worldwide standard in lighting technology. Follow our posts and stay tuned with our LED lighting company as we write more about outdoor LED bulbs, lighting for parking lots, rebates for LED lights, and more! Feel free to reach out to us with any questions. Save Money On Lighting Costs Today!